There were plenty of wildflowers in so many colors, and they were stunning! When we got home, I was inspired to pick up these charms that I had drawn and etched last spring and play around with some color. The charms are etched on jeweler's brass and dirtied by the torch after soldering. They still need to be cleaned up, sanded, and polished. The gemstones are Hessonite Garnet (the red/brown beads), Citrine (golden yellow), Labradorite (the grey-blue beads) and a tumbled Emerald. I am very happy with how the ring is coming along. I had planned to wrap the flower all the way around the finger. As I was hammering it into shape, I stopped here, and I really like it. I love when this sort of thing happens, when the piece tells you what it wants to be. 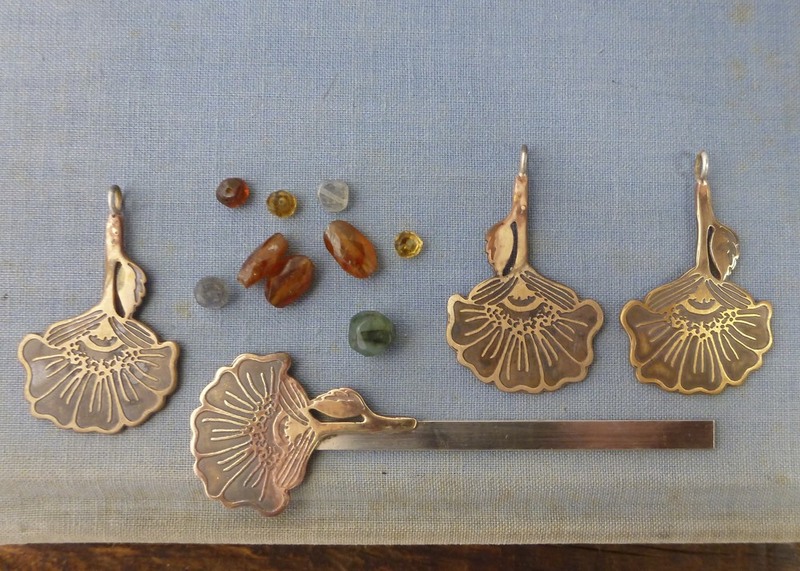 After these pieces are done, I think I'll work on a cuff bracelet. I'll post pictures of the finished pieces, along with photos of the gorgeous subalpine meadows of Mt. Rainer.